Returning to the Bay . . . in a Jam, So to Speak! Quick update first: we are currently back in the Annapolis area for a little while to visit home, see family and get some work done on the boat. We have completed an entire year of cruising and will take a little rest and reflect on our adventures. More on that in another post. 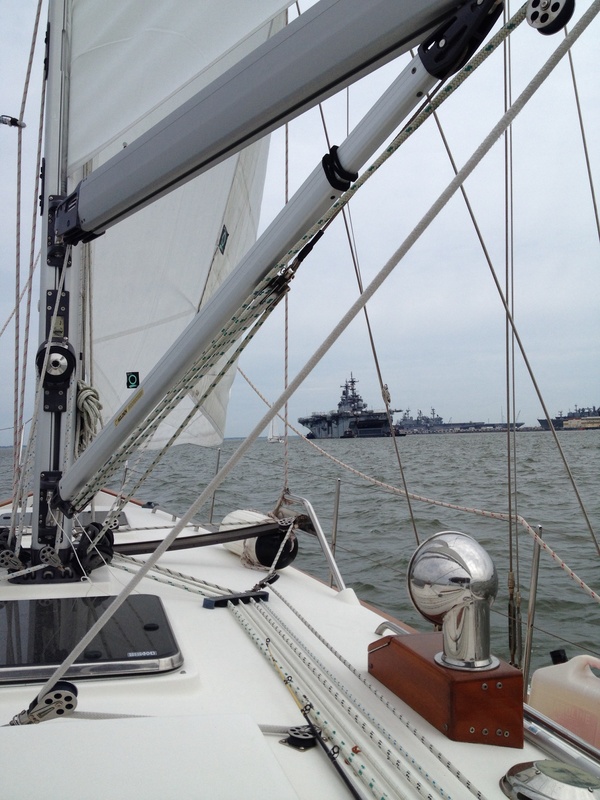 But right now the story of our re-entry into the Chesapeake Bay. Well, we were so excited to get back in the bay. We had transited the Dismal Swamp and passed through the Norfolk/Portsmouth, Virginia area (wonderful boat watching territory passing by the navy boats in port). The planets and the universe aligned and, almost totally coincidentally, we were about to reunite with our water family on Magnolia and Mandala. We had no idea that Mandala was at the end of a 5 day passage straight from the Abacos into the Chesapeake and were about to land 10 miles north of us until we happened to hear them on the radio. 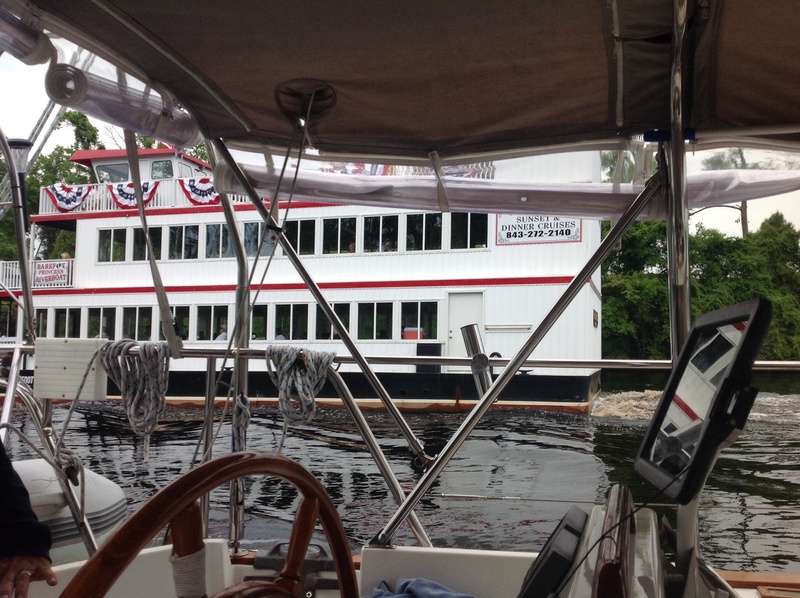 We had been in contact with Magnolia and they were planning to hold up in Solomons, Maryland so we could catch up to them and have one more night together to celebrate our year of cruising before we all went back to our separate ports. 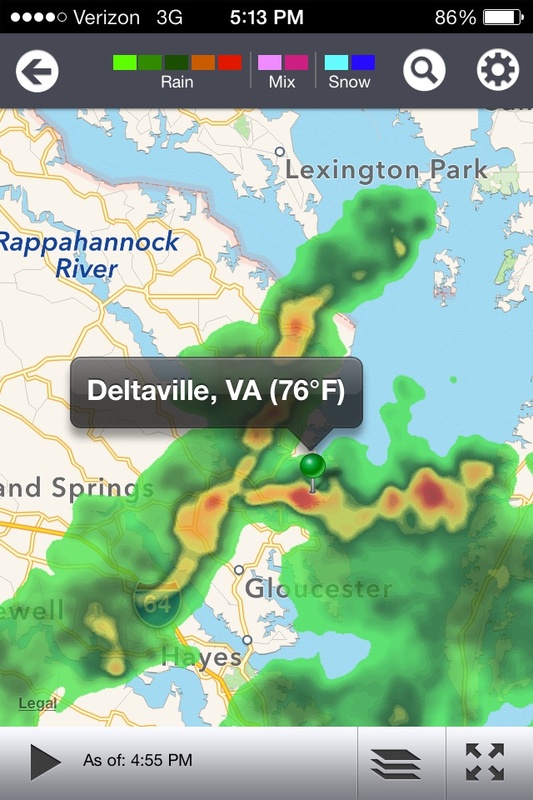 But as it ended up, we all decided (mostly independently) that we would head to Deltaville, Virginia that Saturday . . . and we were all going to end up there together! Happy day! Magnolia was already at anchor in Deltaville. Mandala and Eleanor Q were headed there. All was going well. 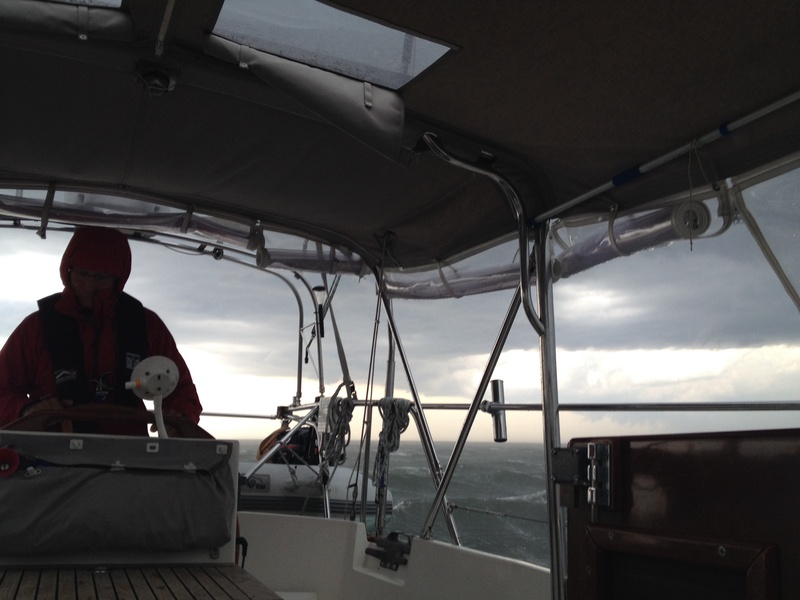 We had fair current and were blazing by Norfolk at about 9.5 knots – very fast for us! We converged paths with Mandala and had about two hours to go to Deltaville when we were hit by severe thunderstorms – our worst weather of the entire year. But we had plenty happen before the storms . . . 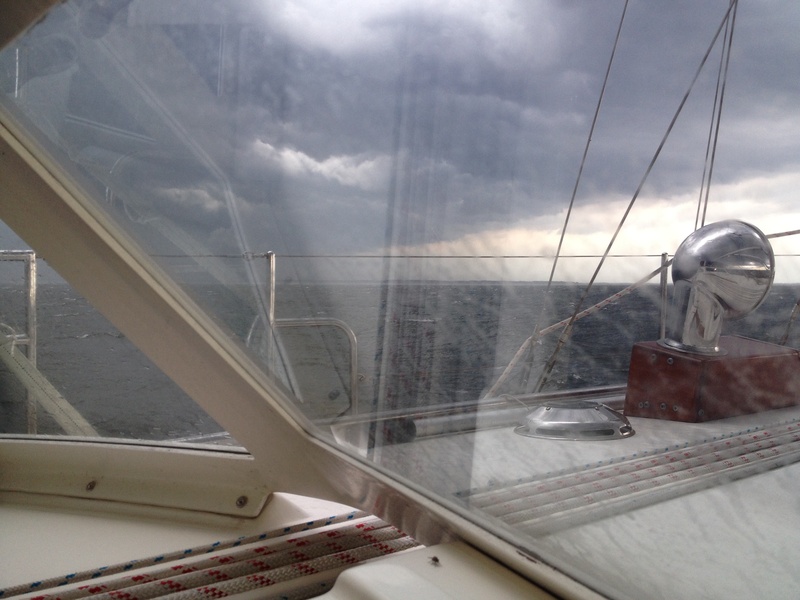 The winds had been perfect at about 15 – 18 knots. The conditions were great. I went below to fix peanut better and jelly sandwiches for lunch. (Hey – they’re fast and easy. Don’t mock.) The sandwiches were done but laying open on the counter. The jam was still sitting on the counter. Suddenly, a freak rogue wind came out of nowhere. 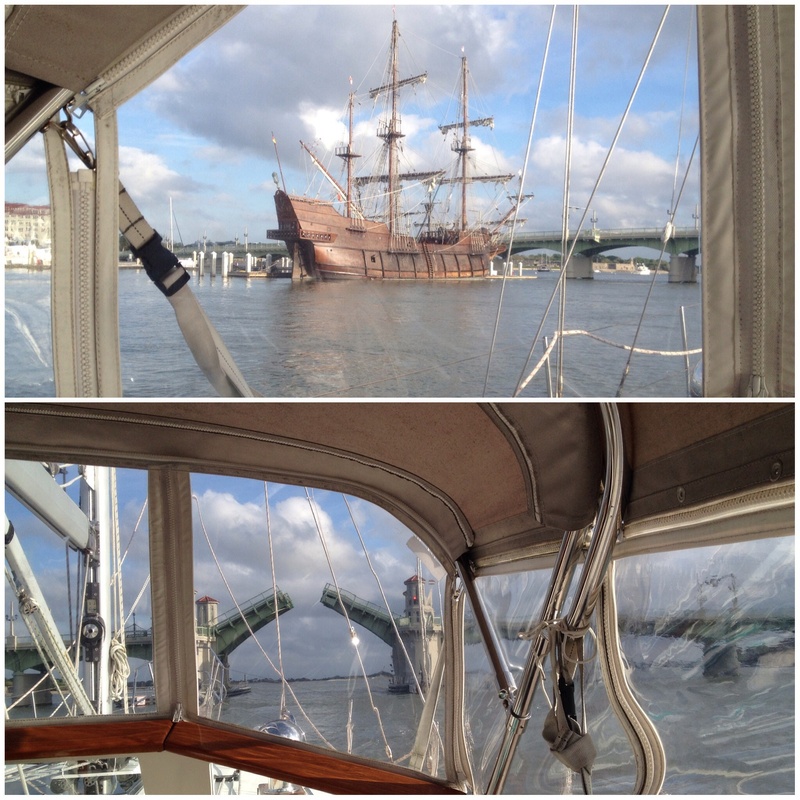 We had all three sails completely out. Frank was at the helm when, in about thirty seconds time, the wind went to 20 . . . 23 . . . 26 . . . and then hit a sideways gust at 30 knots! We do not want to be under full sail when that happens! The boat heeled over hard and was nearly sitting sideways. (We were not in danger – they are built to do that if they have to and our boat can take it . . . but it isn’t ideal.) I was still below when it hit and I heard and saw stuff starting to fly about. I had secured things pretty well, but there are a few extra books or magazines or other non-breakable stuff that will fall off of some shelves if I haven’t taken extra care. No big deal. It’s “just” the bay, right? We weren’t in the ocean or the gulf stream. How bad is it going to be? Mistake. I had dishes stored in the microwave. Pitching sideways with such a violent force, the latch on the microwave door didn’t hold and the plates became projectiles across the galley – they flew the complete width of the boat. We have very little that is breakable on the boat – no actual glass glasses for example; but we do have some heavy ceramic plates for our bigger dinners. You just don’t always feel like eating off of plastic, you know? Anyway, I thought the microwave was a secure enough stowage unit for them. On a normal day, it is. But this was freakish. The ceramic broke with such intensity that I was picking shards out of the wood. Broken pieces of plates were everyhwere. It looked like a tornado had come through. But to add insult to injury, the peanut butter and jelly sandwiches flew with the dishes. Worse than that, the plastic jam container had still been sitting on the counter and was sliced wide open by the flying shards. Strawberry jam was everywhere. I am still finding jam on the ceiling today. I was in such shock as I saw the damage . . . beautiful wood on our boat with big gouges in it. Broken plates all over. I couldn’t even figure out what had just happened. But first matters first – Frank was calling to me and I ran up top to quickly help him get some sails in. He had already headed up into the wind to get the power out of the sails which cured the heeling immediately. (That sentence sounds like an oxymoron or a joke or something . . . “cured the heeling.”) Anyway . . . once things up top were in control, I went back down below to start the clean up. Hey, it’s just stuff and some bumps and scratches, right? No people were damaged so no big deal, right? I have an odd aversion to things like glass breaking. I told Frank this a long time ago; he understands this about me. It is irrational and I don’t know where it comes from. So I will confess openly right now . . . I cried the whole time I cleaned up. Hard. I wish I could explain why, but I can’t. It was just the surprise of it, I think. I briefly thought about taking pictures of the mess, but there are just some things you don’t want to look at again. So then, just as oddly, ten minutes later the wind died. Nothing. Caput. We were practically becalmed. I am not making this up. Guess what that meant? The black flies showed up. Droves of them. All we could do was keep swatting them away from our ankles which became the fly buffet for the day. It was miserable. We are fortunate that we have screens on the boat, but each time we had to go down below, a portion of the swarm would try to sneak in, I must admit, killing flies down below became therapy for releasing my angst over the earlier episode. An hour later we got hit with the severe thunderstorms. It was a day of total extremes. 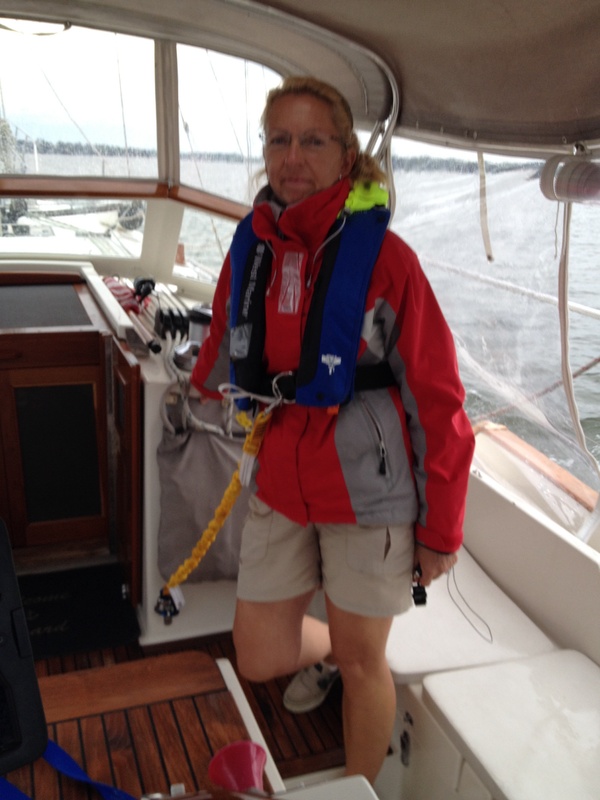 We got ready by donning our foul weather gear and pulling in all of the sails. The storms hit hard. 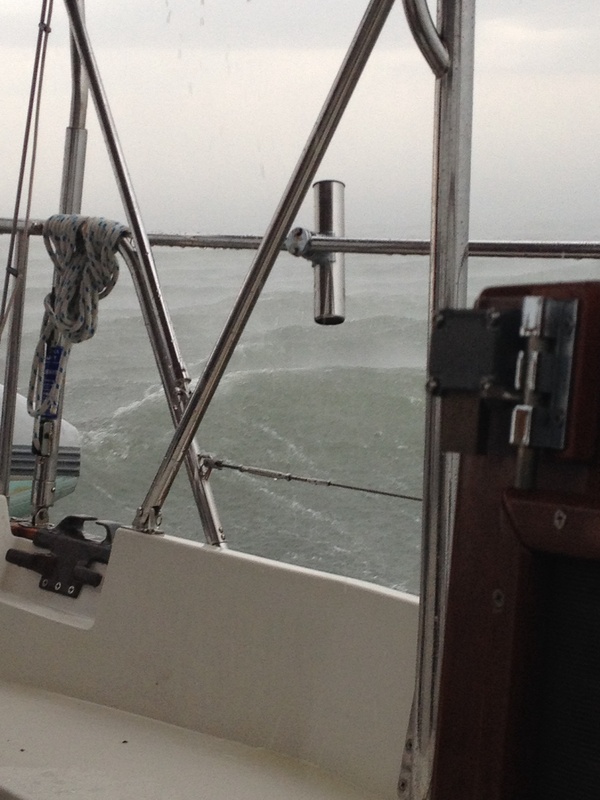 The VHF radio was blaring warnings to mariners. We had nowhere to hide – we just had to gut it out. Getting hit from two sides! Frank looking at the storm’s progress. Again, our boat can handle it and I have a very competent captain who knows how to handle the boat in these conditions. He’s been telling me for three years that I need to experience a Chesapeake thunderstorm – well, he finally got his wish. We had sustained winds of 40 knots with gusts to 48 for more than thirty minutes. It was not much fun. And in the midst of that, we were going through a minefield of crab pots. My job was to watch for and point out the pots. I was tucked under our dodger and somewhat protected. Frank was getting soaked. For the bay, we had some pretty good seas. He slowed the boat down and put her nose right into the wind and just rode it out. That’s about the best you can do. Mandala was close by, so we knew we had company! 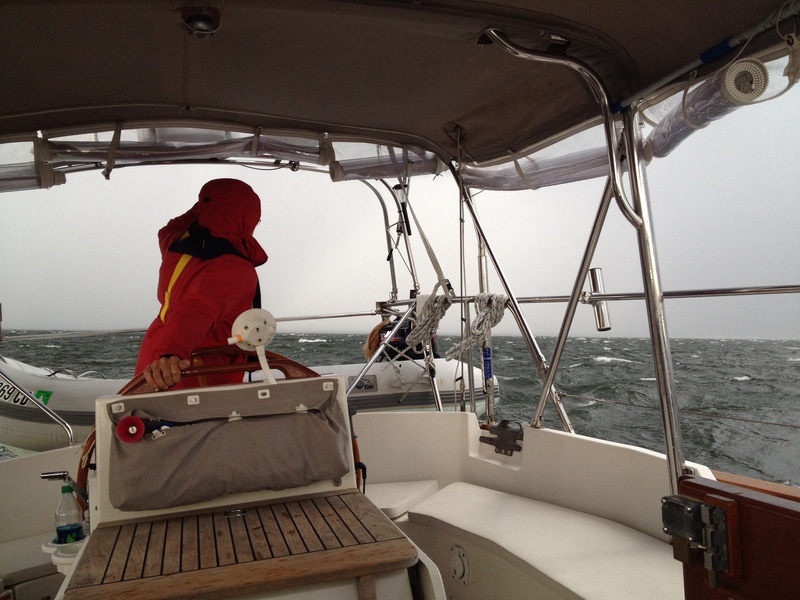 Meanwhile, Magnolia was in the anchorage, but their anchor was dragging n the storm, so they had issues of their own! Oddly enough, as uncomfortable as it was, we laughed later at the fact that I was far more upset at the broken dishes and jam episode than I was over the thunderstorms and high winds. I don’t know what that says about me. Don’t often see real waves in the bay. Whew. Through the worst of it! We were both safely tethered to the boat. Bottom line: our three boats met for dinner aboard Magnolia and had great stories to tell about the day over good food and wine and great company. Mandala has spent just a little time on the bay (they are from Maine) and we assured them that they got the worst of what the bay has to offer all in one day – there is nowhere to go but up! We were rewarded the following day with the most beautiful weather conditions and the beauty of the bay as we generally think of it. We are moving north fast . . . well . . . for a sailboat, anyway. So I will try to hit the highlights of our favorite places through South and North Carolina. We stopped at some of the same spots we experienced on the way south in the fall, and we hit some new places, so I’ll focus on the newbies here. Many other cruisers talk about the fact that they would NOT like to do the constant grind of the ICW. Now traveling it for the second time, there are definitely sections that are a grind. But there are also some of the most beautiful sights, too!! 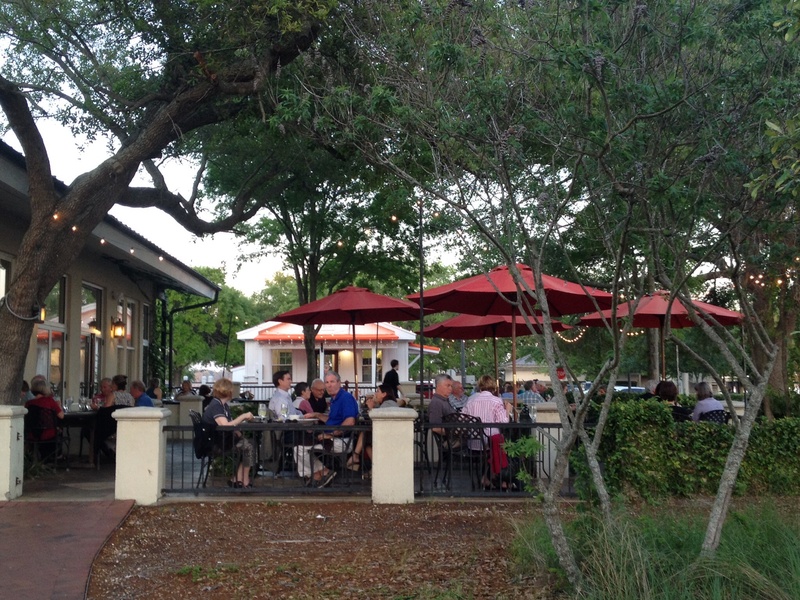 We stopped at Beaufort, SC again (byoo-furt) and enjoyed a lovely afternoon wandering town and having a nice date night at a restaurant on their beautiful waterfront. Okay, with my new found interest in history, let me tell you a quick story about Robert Smalls. In as few words as possible – he was an African American born in the shed behind a large water front house in Beaufort (which is beautiful) where his mother was a slave – which meant he was a slave as well. His master sent him to Charleston to work various jobs to earn more money. After working the docks and learning all he could, he eventually became a boat pilot. He was put into service on a Confederate ship, the USS Planter, as one of the “drivers” (blacks would not actually be referred to as pilots or captains). It was carrying important munitions and tactical information as well as it’s own guns. When the three white crewman decided to go ashore for the evening, Smalls dressed as the captain, put on a straw hat like the captain’s, and proceeded to pilot the boat right out of the harbor. He headed north (after stopping to pick up his and his fellow crew members’ families) hoisted a white sheet and turned the boat over to the Union Navy. He received prize money for the capture of the boat and later met President Lincoln. He later served as the first black ship’s captain in the U.S military. After the Civil Rights Act was signed, he returned to Beaufort, BOUGHT the house where he and his mother were slaves, became a state senator and then served in the U.S. House of Representatives for South Carolina. AND, when his former master’s wife was very elderly, he let her come back to live in the house that she had known for so many years. How many things are amazing about that story? We learned this wandering through just the front of a small museum on the main drag in town. 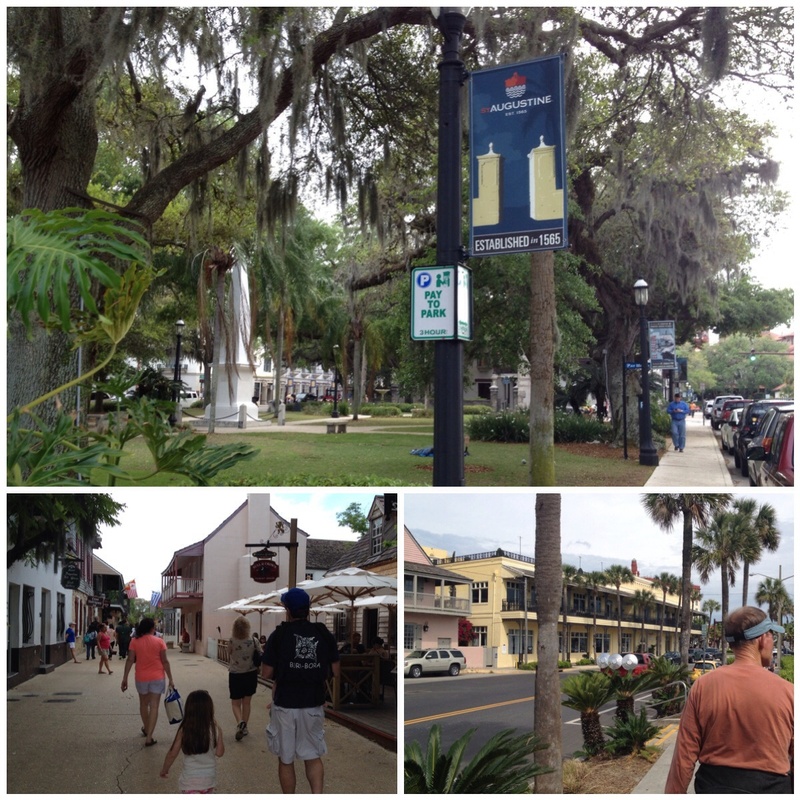 The weather was perfect for our stroll around town and we loved it as much this time as the last time. And, we found ice cream after dinner! 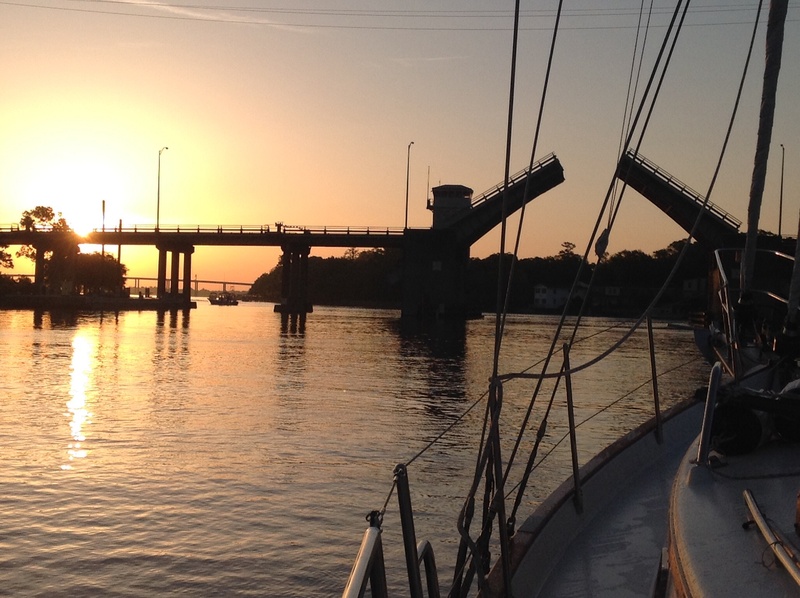 Then we headed up past Savannah (anchoring south of town for a brief rest) and charged by Charleston to maintain our target of getting to the Chesapeake in mid-May. 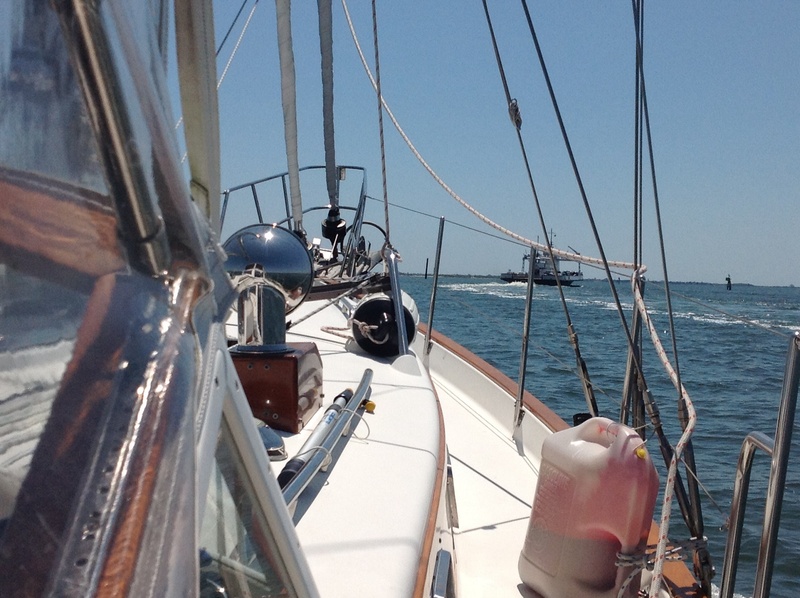 We kept on going and anchored at Butler Island, an easy “in and out” off the ICW. It is wide open but quiet and comfortable (on a settled day) and is at the beginning of one of our favorite sections of the ICW . . . the Wacamaw River. 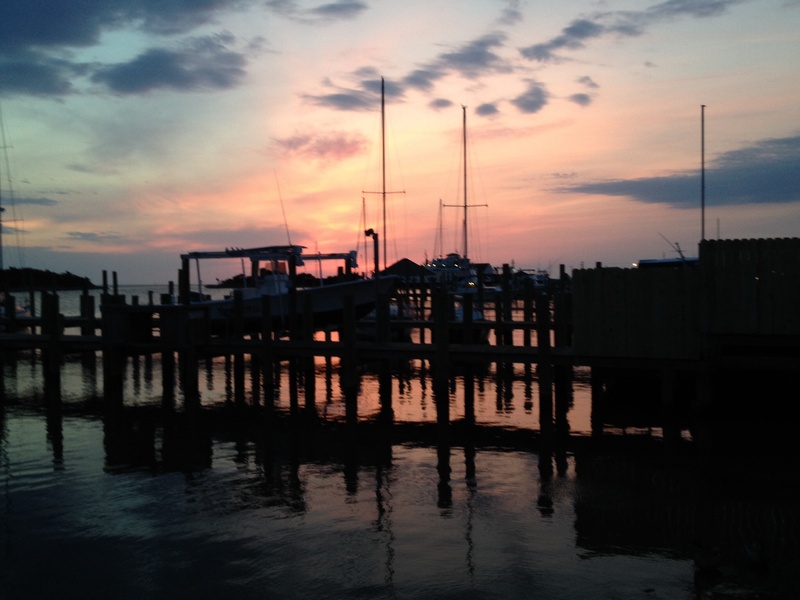 Sunset at one of our scenic anchorages. The Wacamaw is tranquil, peaceful, largely uninhabited – delightful! A bridge opening at sunrise. We’ve had very early starts lately! 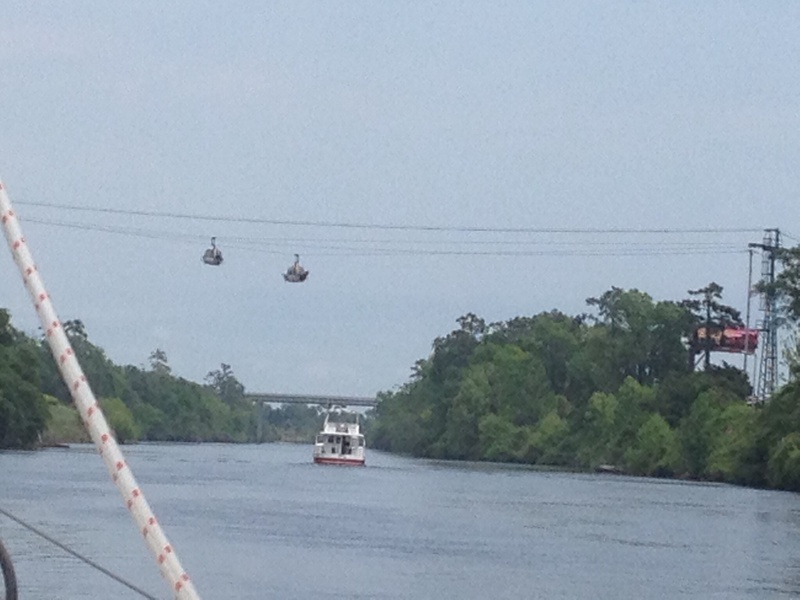 We saw the cable cars this time! These take golfers from the parking lot to the clubhouse. 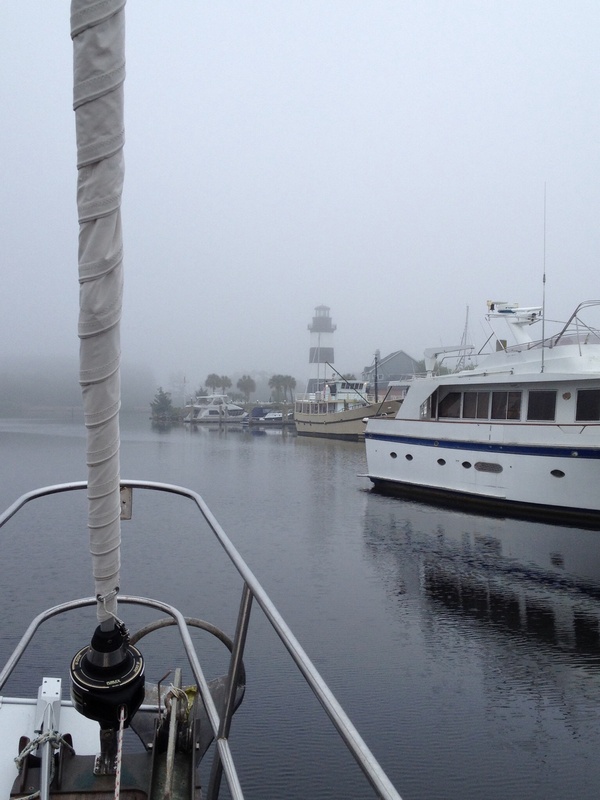 A foggy departure from Myrtle Beach Yacht Club – stayed this way for only an hour. We crossed the state line and went in to North Carolina, destination Southport. How did we miss Southport on the way down? What a great place! 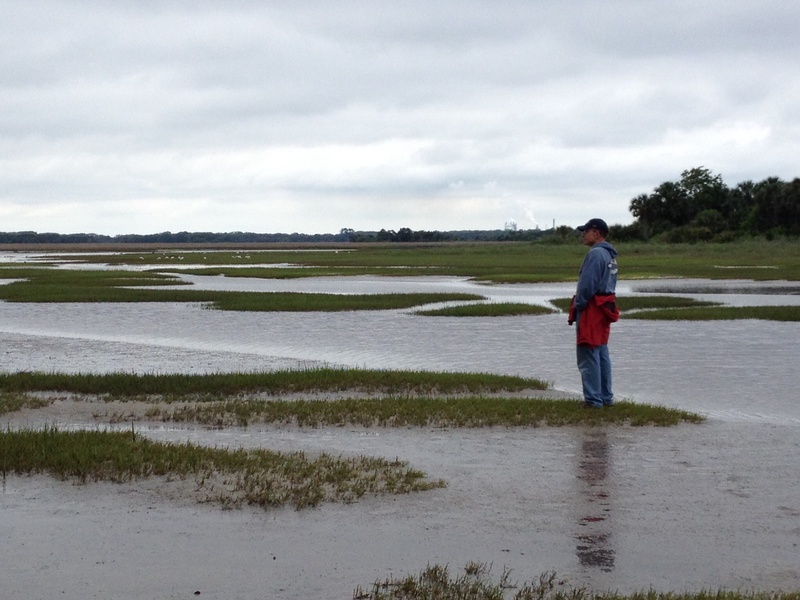 This is the mouth of the Cape Fear River – you’ve heard of Cape Fear? We stayed here for three nights on threat of bad weather and it was a great stop, so a little more about Southport. It is very “nautical” and has the feeling of an old fishing village. 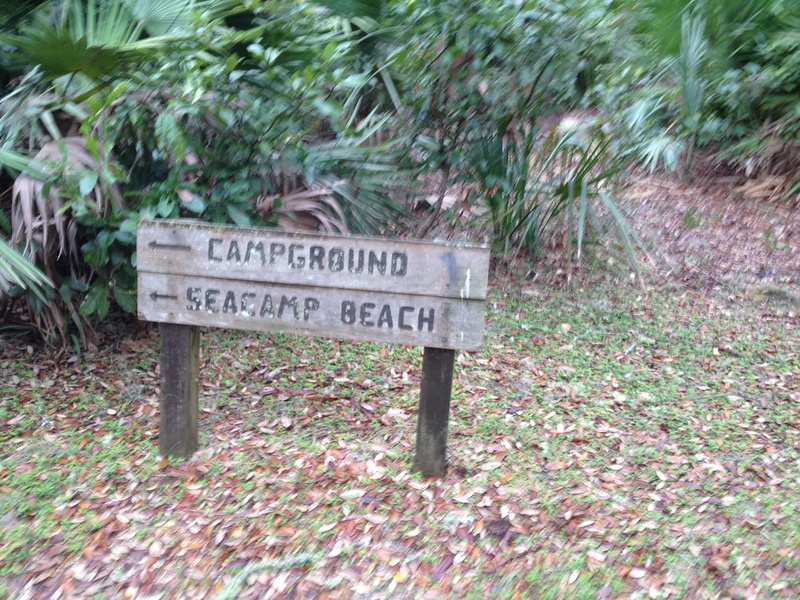 The movie ” Safe Haven ” was filmed there a few years ago (featuring Julianne Hough of “Dancing With the Stars” and Josh Duhamel.) The town is not overly commercial but offers a number of great dining options and nice shops to poke around in. The neighborhoods are beautiful. The history is interesting. We really enjoyed Southport and would make that a “must stop again” place. 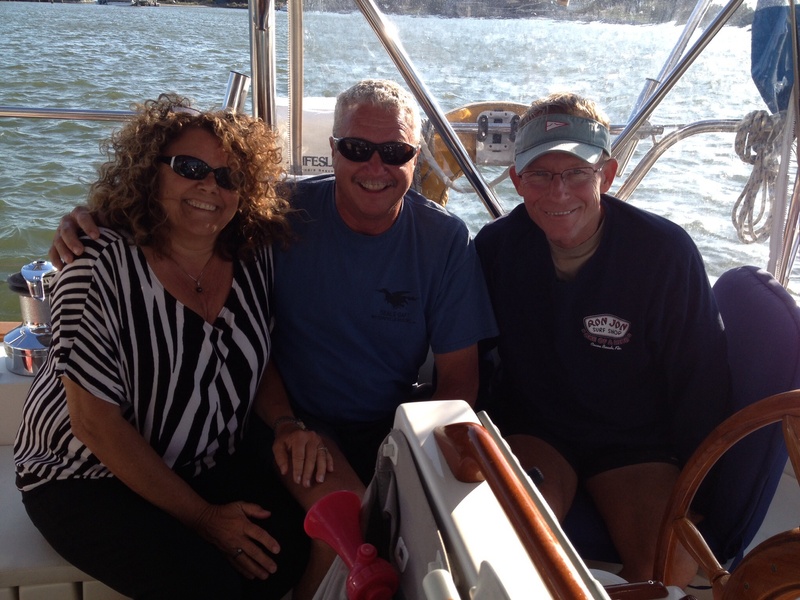 The marina that we stayed at offered a daily weather and navigation briefing by Hank of Carolina Yacht Care, a retired Navy meteorologist, a sailor, and he and his wife are former cruisers. His daily briefing was top notch and we used his shuttle services to do some provisioning. And we took Hank a dark and stormy for the last days’ briefing (sort of like taking an apple to the teacher.) 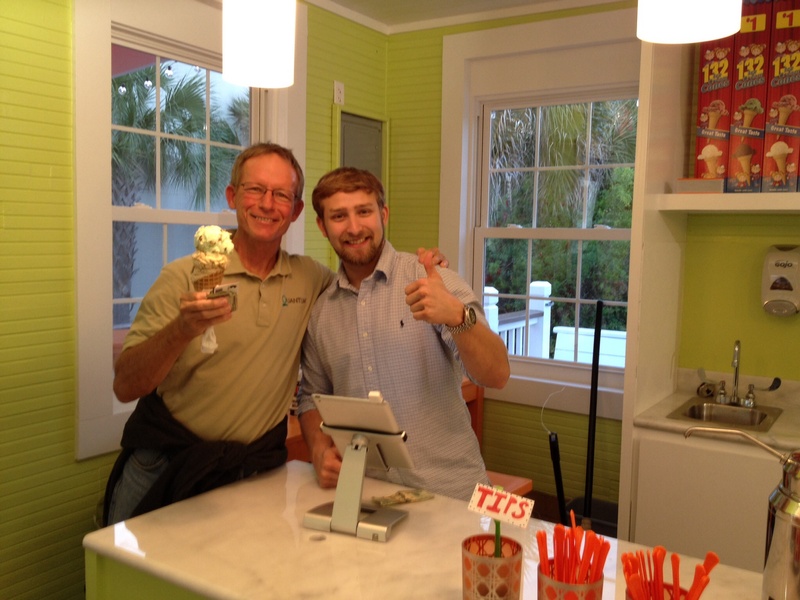 What a great guy, a great service, and a great business he offers. Big fans, Hank. Finally the weather broke and it was time for us to go. 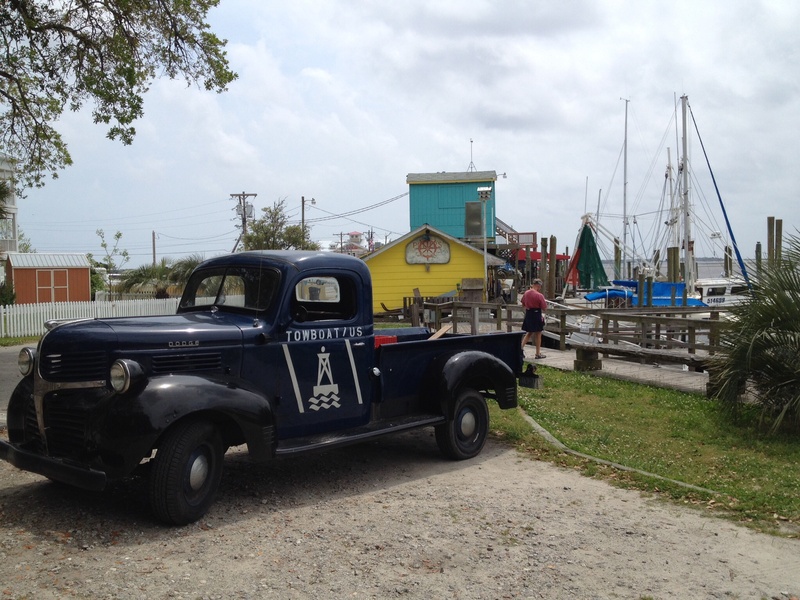 A cool, classic truck with an old logo as we walk into Southport. 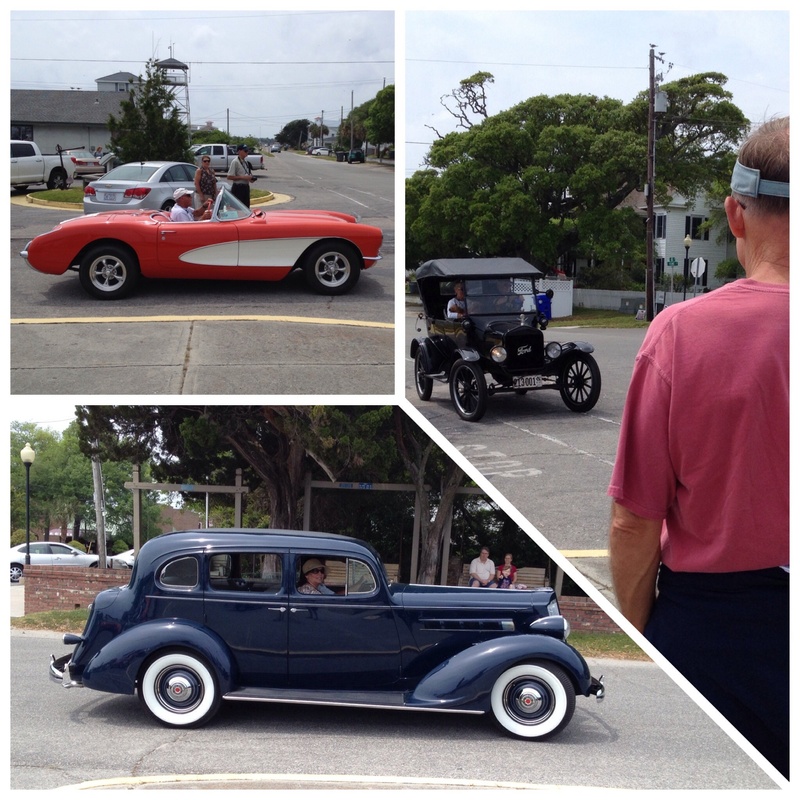 There must have been a classic car show close by! Pilot boats are sent out to usher large vessels into the inlet. Eleanor Q parked at Southport Marina. We enjoyed dinner with some new friends at a local eatery. Nice sunset! The next night we had a more eventful night than we would have liked at the anchorage in Camp Lejeune. No, it had nothing to do with marines boarding the boat . . . it had to do with the strange noise I heard come from the engine earlier in the day. It was a metallic “ping” sound which meant something hit a fan blade. No other bad noise followed and we continued on. No problem. What we found when we anchored is that the bolt holding the alternator on had sheared in half. We were lucky the alternator didn’t fall off during the trip! We thought we were going to have a big problem and made a reservation in a close by marina for the next day – just in case. Of all the spare parts we have on board, that particular bolt wasn’t one of them. Amazingly, after a little chatting on the VHF, fellow cruisers came through once again! 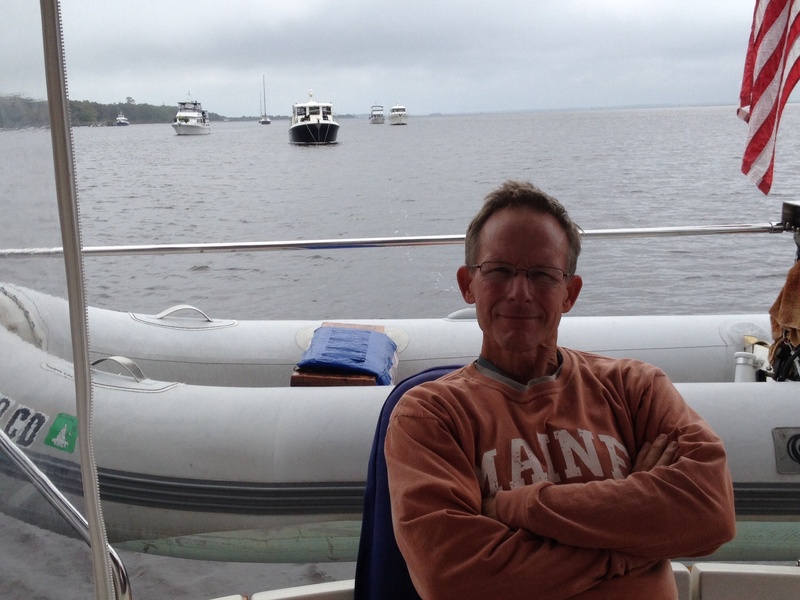 Frank had located the right bolt on a neighboring boat and had the repair done by 9:30pm!! (I won’t mention that in the midst of that repair, the engine decided it wouldn’t start, so then we were looking at the possibility of being towed out of the anchorage.) Happily, the persnickety starter cooperated, the new bolt held with some minor modifications and we were off as scheduled the next morning (following a very stressful evening and largely sleepless night!) We made SERIOUS tracks past Oriental (yes, we passed Oriental. All boaters are gasping now . 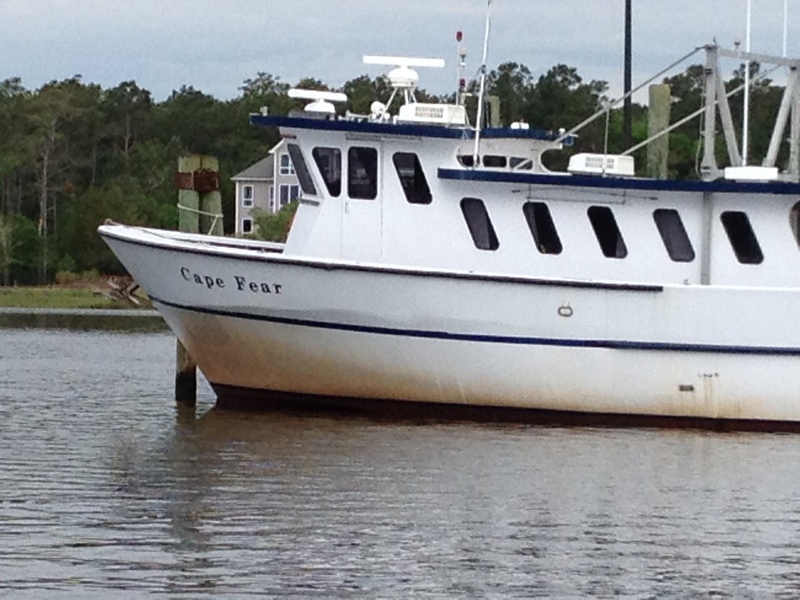 . .) with a very specific mission in mind: reach Ocracoke Island the next day! OCRACOKE! 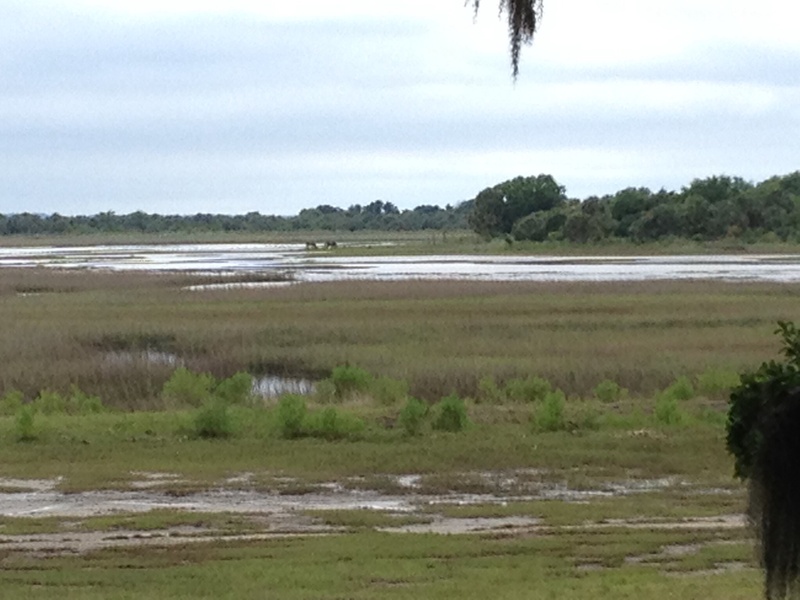 What a beautiful, wonderful detour off of the ICW it is! 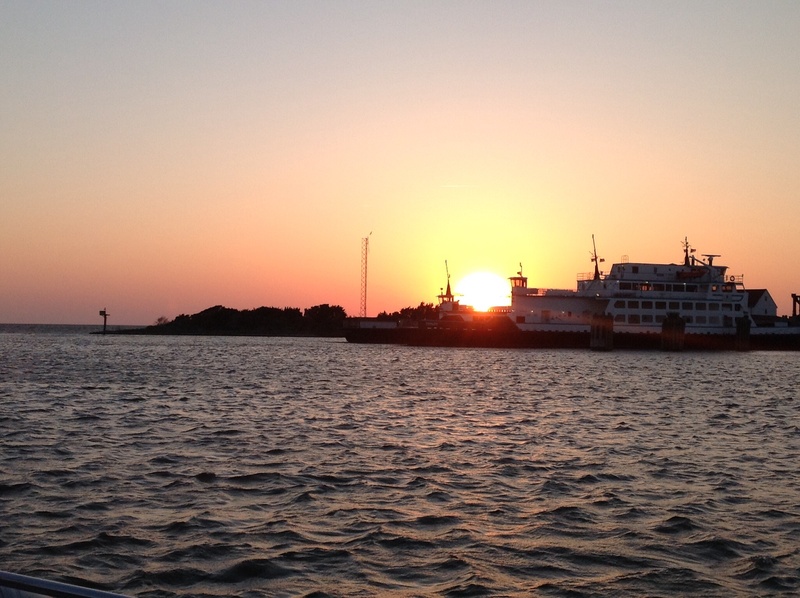 This is not a “typical cruiser destination” because it isn’t on “the route.” It is actually in the Outer Banks – the next island south from Cape Hatteras, but is part of the Hatteras National Shoreline. It can ONLY be reached by boat (or plane) which are my personal favorite kind of places to go. 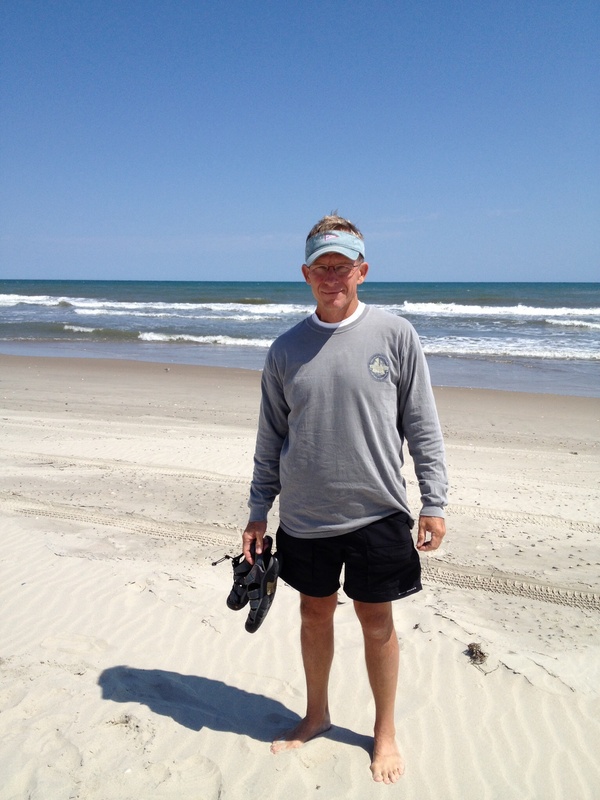 Plus, Frank has a boyhood friend (high school and fishing years) who lives in Buxton on Hatteras. Joe and Josie hopped a ferry and came over to see us for the afternoon! What a great and happy reunion. 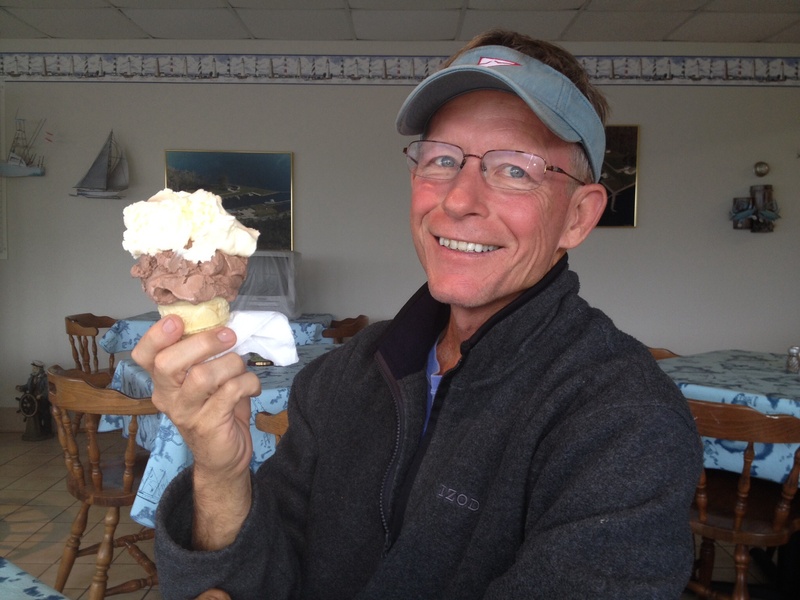 If you’ve been reading this blog for a while, last fall I told the story of our time in Cape May when Frank was reunited with one of his life long friends and fishing crew mates who was on the ill-fated Marjorie Snow, the fishing boat that Frank ran hard aground on his first day as a captain. Well, Joe was the third of the three man crew on the boat. Wow, do Frank and Joe have the stories and the history. We were so happy that the four of us could spend some quality time sitting in the cockpit of Eleanor Q after a delicious lunch on land. We looked out over the very scenic town and Silver Lake. Frank and I spent the next day walking and biking all around the island. Again, old fishing village feeling that has some terrific restaurants and shops, but is not overly commercial (at least not before Memorial Day.) I could have stayed there happily for a week, but you know us . . . we’re getting itchy to get home making it hard for us to stay in one place for more than a couple of days. 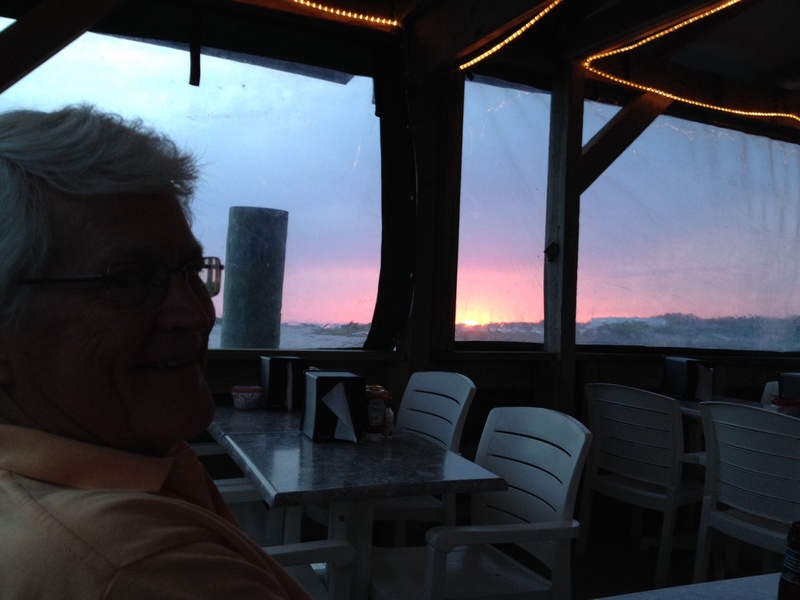 We will make Ocracoke a must do place as well – and we’ll stay longer!! There is an airstrip there that Navy pilots training for larger jets use for practice and a lunch stop. I’m not kidding. Here came these three really beautiful airshow quality-looking planes (almost like biplanes) doing aerobatics. Then they landed in the distance. 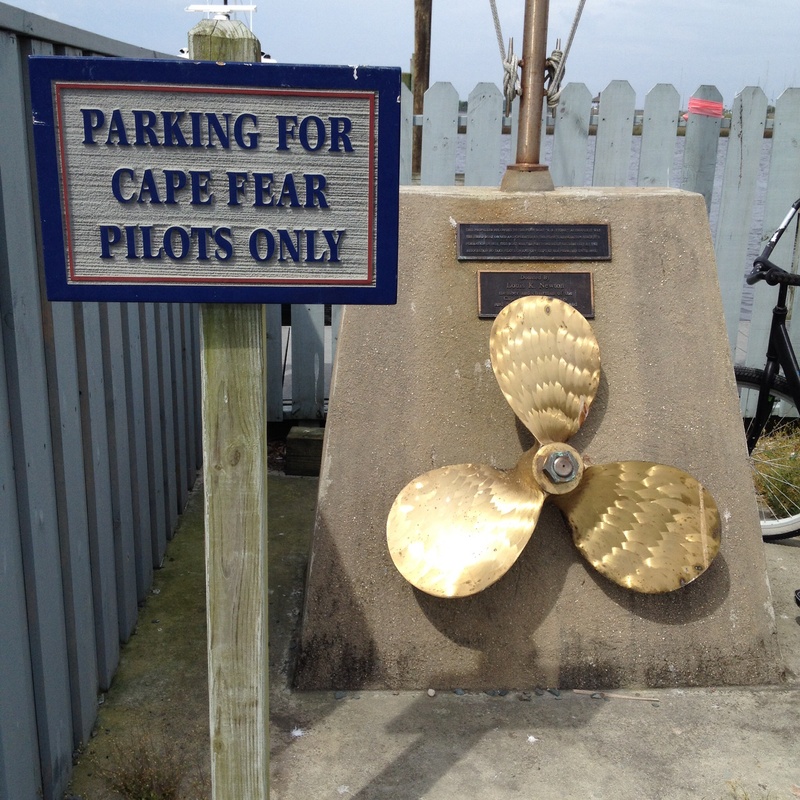 We got the local scoop that they stop on Ocracoke, take a golf cart to the nearby restaurant and then fly back out. We pulled our bikes into the parking lot just as the flyboys departed in their golf cart and I only caught a glimpse of them. DARN IT. Uhm, er, I mean they aren’t NEARLY as cute as Frank is, of course! We knew the entrance was a little tricky. 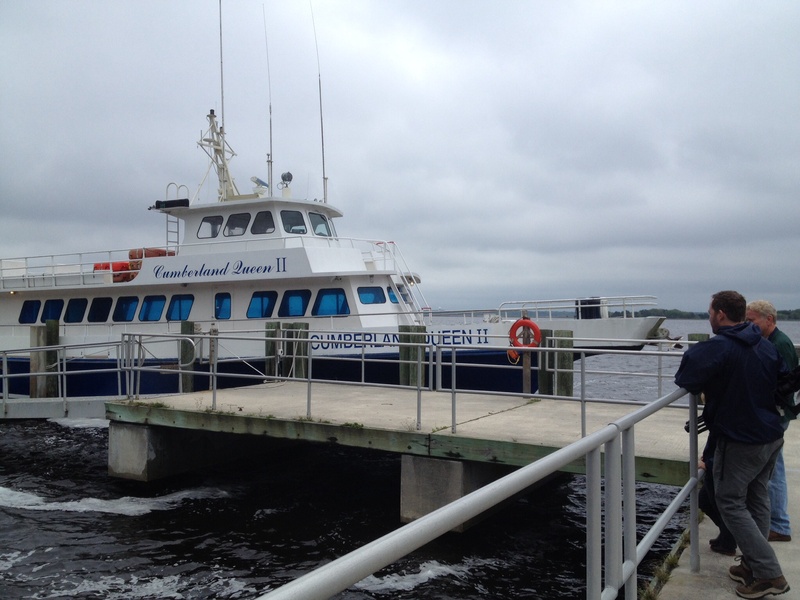 Problem solved – follow the ferry in! Sun setting over the ferry docks. We walked briefly on the gorgeous beach on the Atlantic side. A chilly wind made the walk a short one. 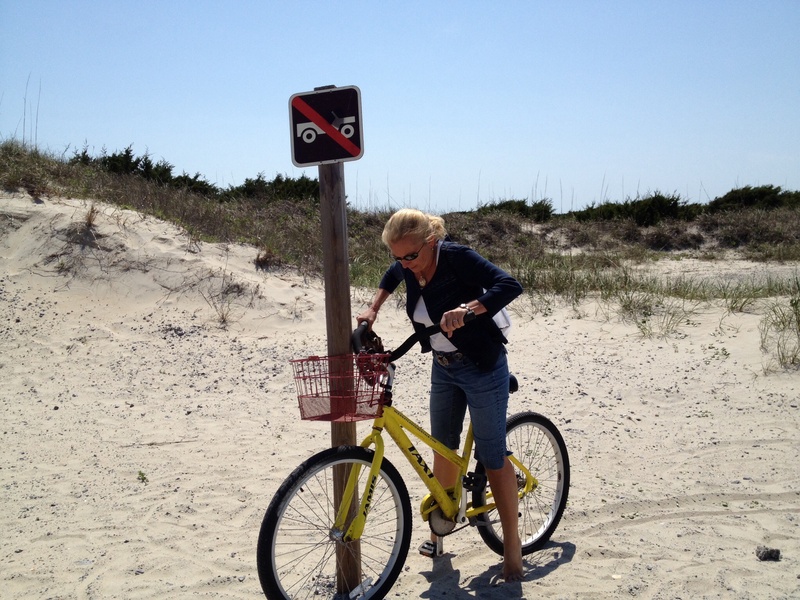 I think I just discovered that I was about to ride before putting my sandals back on. Duh. 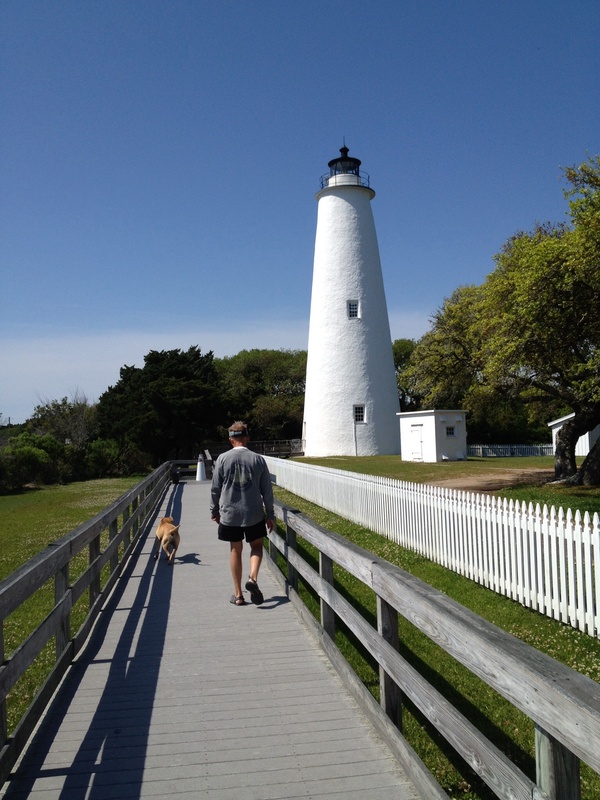 Ocracoke lighthouse. It isn’t open to go inside, but the grounds are pretty. Frank meets a new canine friend who escorts him. As we continued our ride, we happened on to a roving band of musical pirates singing old sea songs. I think they were doing a promo for an upcoming show. 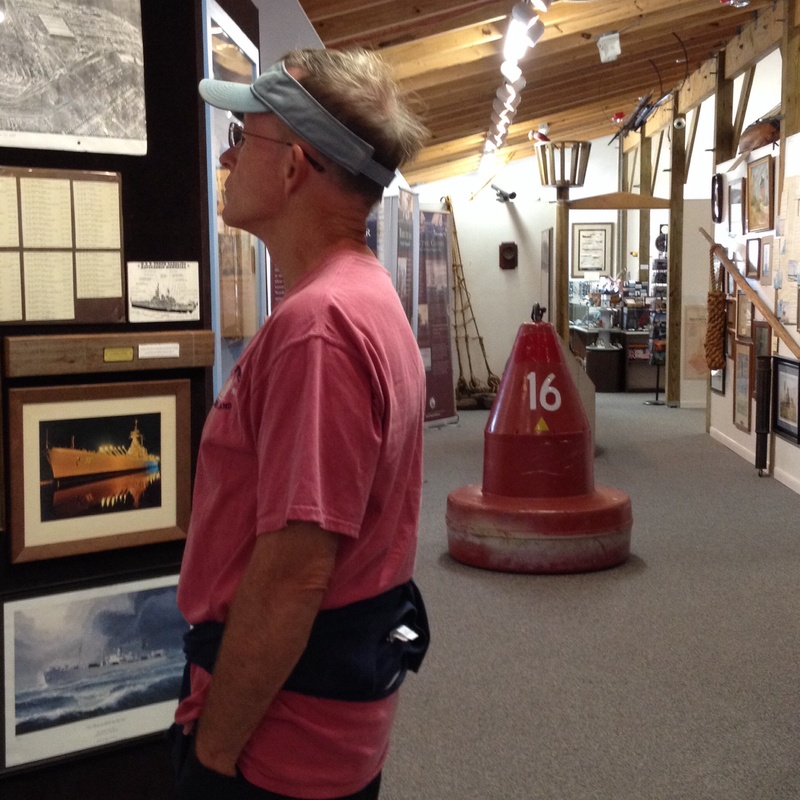 Ocracoke seems to have a decent arts scene: galleries, music a theater . . . This sign on a local store cracked me up. I guess their marketing strategy didn’t work since the place is for sale. Beautiful sky over the docks. 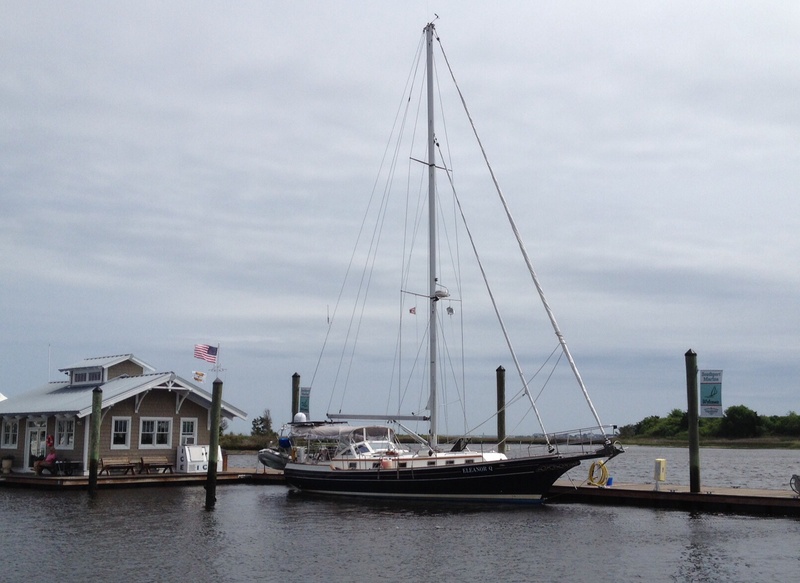 We left Ocracoke and made a stop at the Aligator River Marina, place with a little bit of legend to it. It is a known cruising stop. We got fuel and took a slip for the night just so we could eat the fried chicken that we had heard so much about. The place is funky, quirky, country and worth the stop (plus no one was in the laundry). 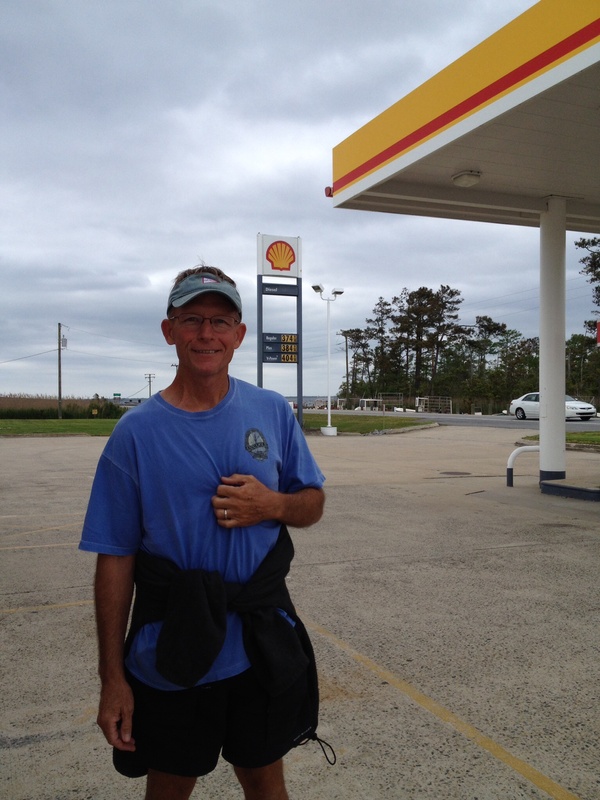 It is a gas station off of state route 17 as well as a marina. The station has a convenience store with a little dining room in the back where we dined on our much desired fried chicken. Two plates of chicken with sides, a large beer, a glass of wine and ice cream all for the whopping total of about $30. Life is good! All served by Ms. Wanda’s daughter-in-law. Ms. Wanda runs the place with an iron fist and she is legendary. We understand you either love her or hate her. I’ll bet we would love here, but we never got quite to meet her . . . just waved as she was driving by. Maybe another time, Ms. Wanda. She lives on the grounds. Talk about being married to your work! 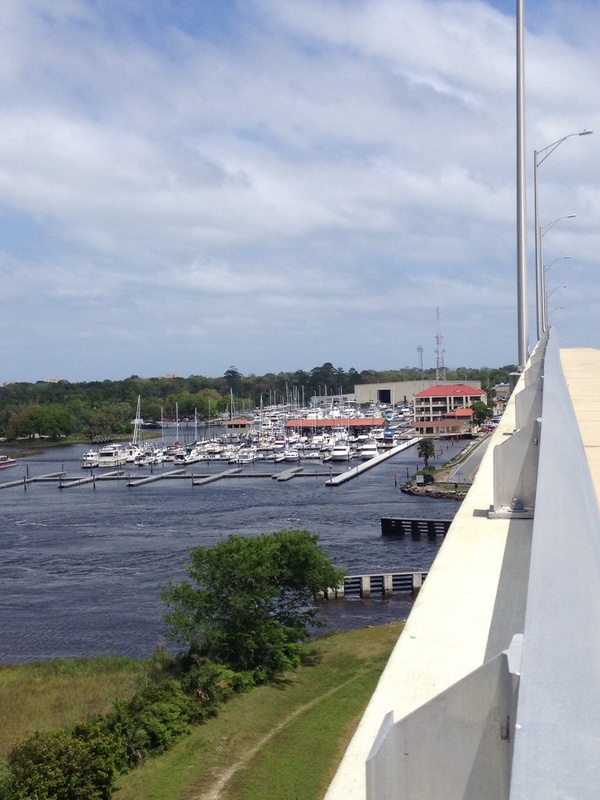 Alligator River Marina (and Shell Gas Station). Looking from the gas station and convenience across to Eleanor Q in her slip close to Ms. Wanda’s house. We ate the famous fried chicken dinner – which had to be completed with ice cream! And on the way back from dinner, Frank spotted a critter. 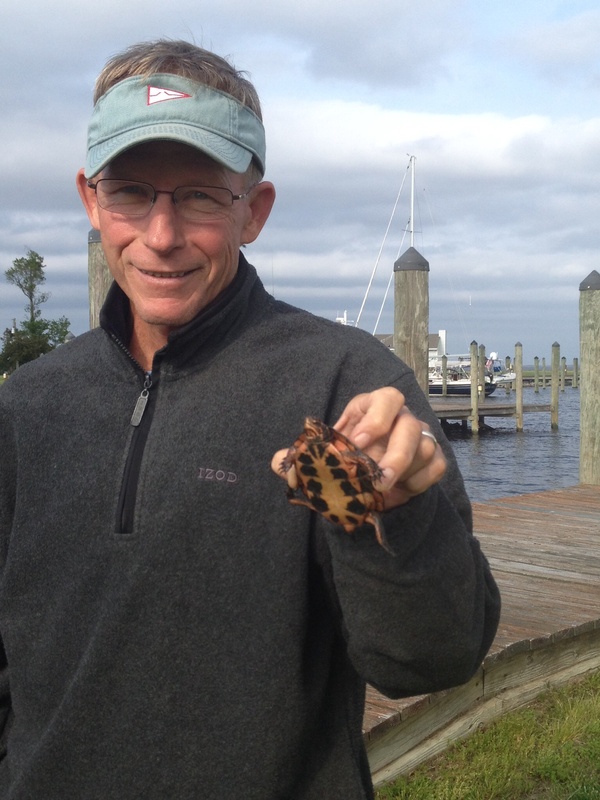 What guy can resist picking up a turtle? And now we are in Elizabeth City getting ready to transit the Dismal Swamp again tomorrow and make our way in to Virginia. 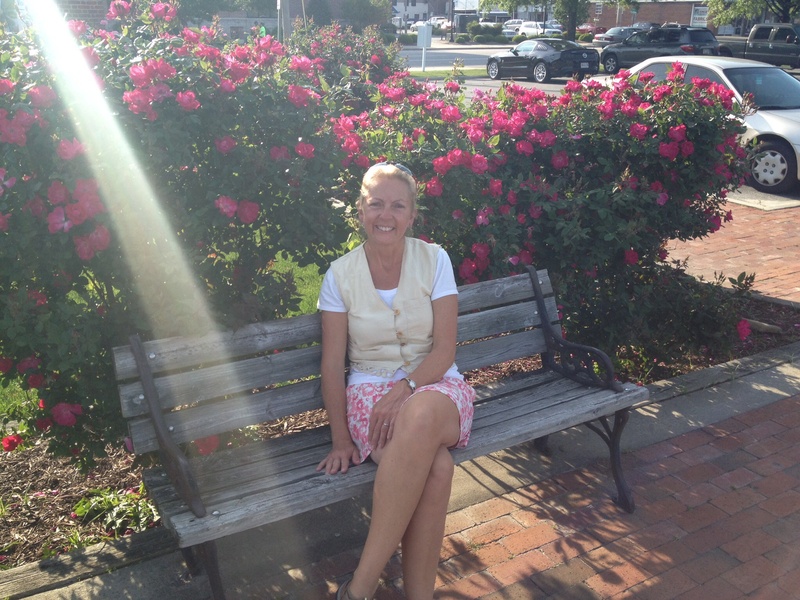 The roses are blooming in Elizabeth City. We are having record high temperatures and are sitting under fans as we speak hoping for the nice breeze to continue through tonight. Tomorrow may be a sticky one going through the swamp, but doesn’t that sound appropriate? Stay tuned. After leaving Daytona, we trucked on up through the state with only a brief stop in St. Augustine. And then we thought we’d just “keep on truckin’.” (Okay, how many of you over the age of 50 had a poster or a sticker on your notebook that said that when you were young? Or was that a West Virginia thing?) Anyway, the weather had some different ideas for us. 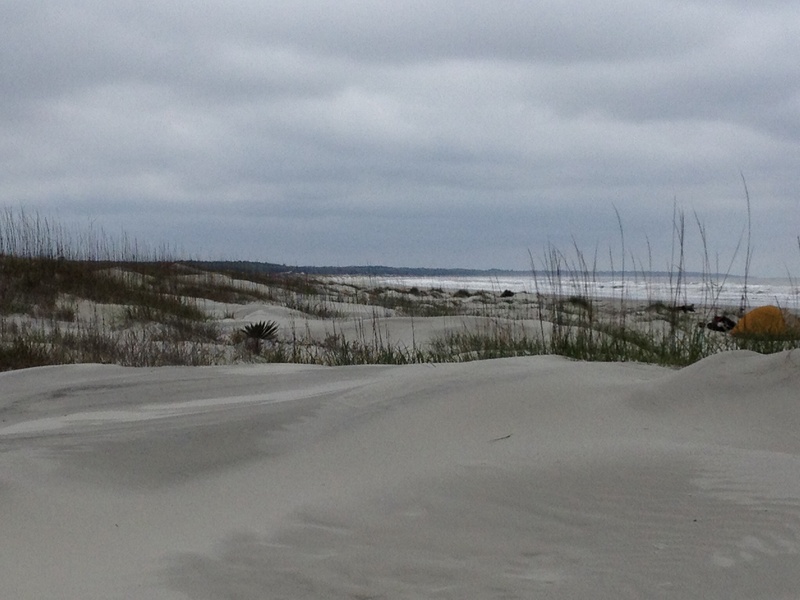 Next we wanted to go to Fernandina Beach. We missed it on the way down . . . and guess what? We missed it on the way back up, too. (You’ll have that.) Between the stretch of unfavorable weather and the fact that there was a trawler (boat) gathering in Fernandina, it just wasn’t in the cards. 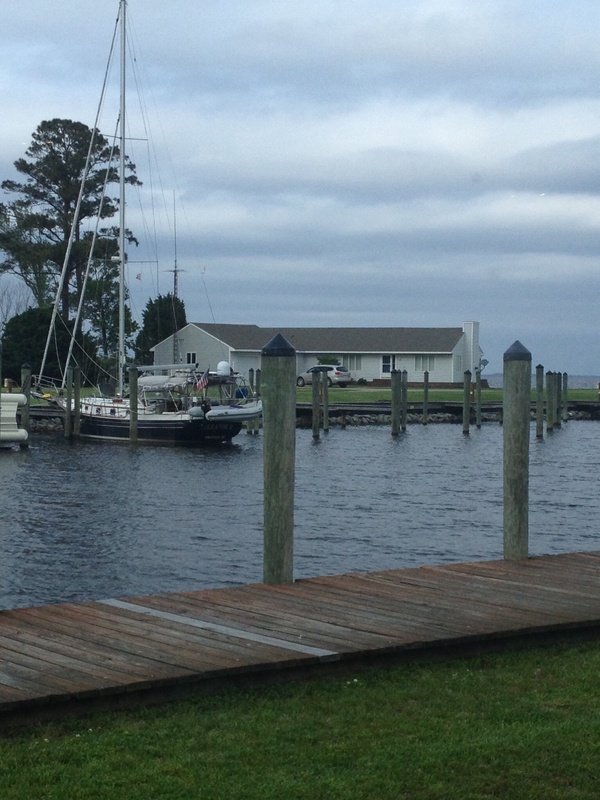 There was more bad weather coming and we wanted to make SOME progress north, so we made it to a marina on the southern side of Jacksonville and sat there for three days waiting for storms to move on through. We managed to get out for a couple of good, long walks up the highway to visit the Publix grocery store and the Waffle House. There were also two fun restaurants on the premises, so we made the best of our days there. 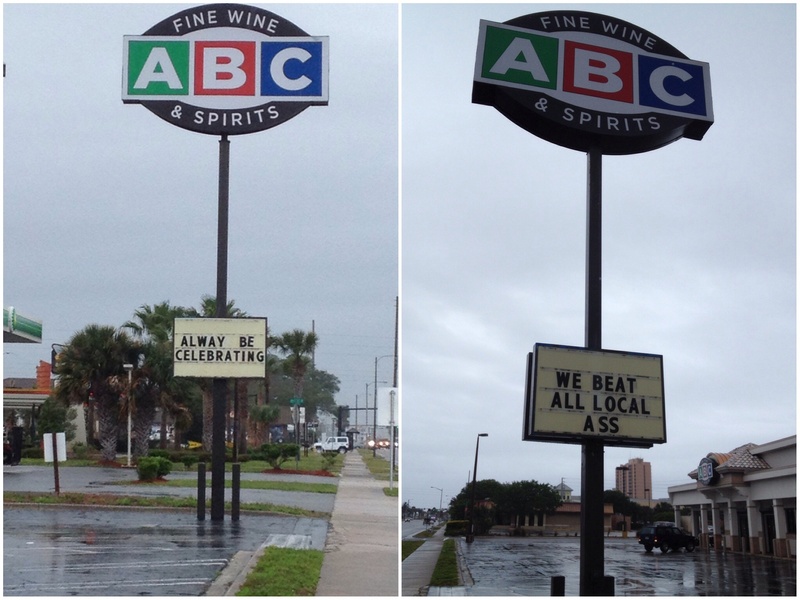 Front and back of sign at the ABC store. I think somebody be celebrating already! The one on the right was on the gas station side of the sign. I think I know where the extra “s” came from! Beach Marine in Jacksonville, FL – our stay during some weather. Next stop, Cumberland Island, Georgia! This is a place we had heard so many good things about and wanted to visit. It is a National Seashore and only reachable by boat. One of the things it is known for is the wild horse population. I most definitely wanted to see the wild horses! We were off and in search of them. 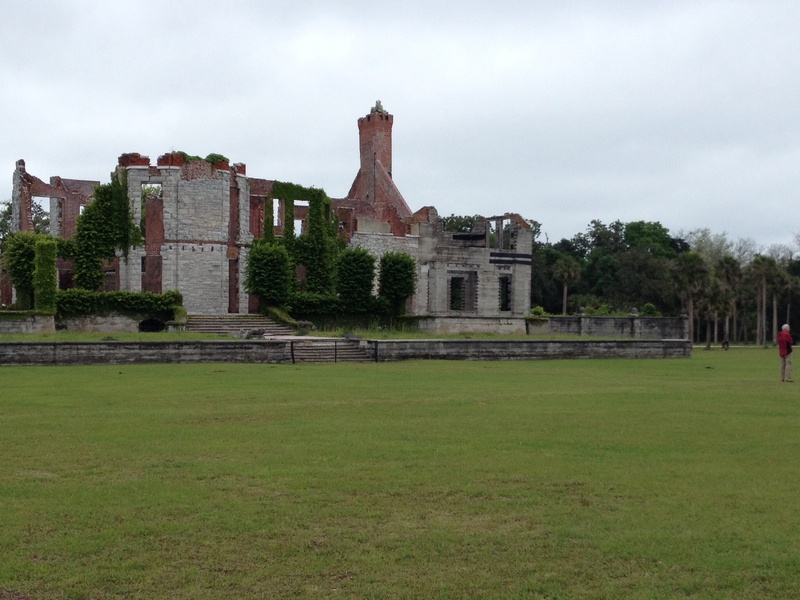 There are three distinct areas to explore on the island: 1) The trails and camp sites in the marsh lands, 2) the beach on the Atlantic side, and 3) the ruins of an old mansion that had been owned by the Carnegies at one point. 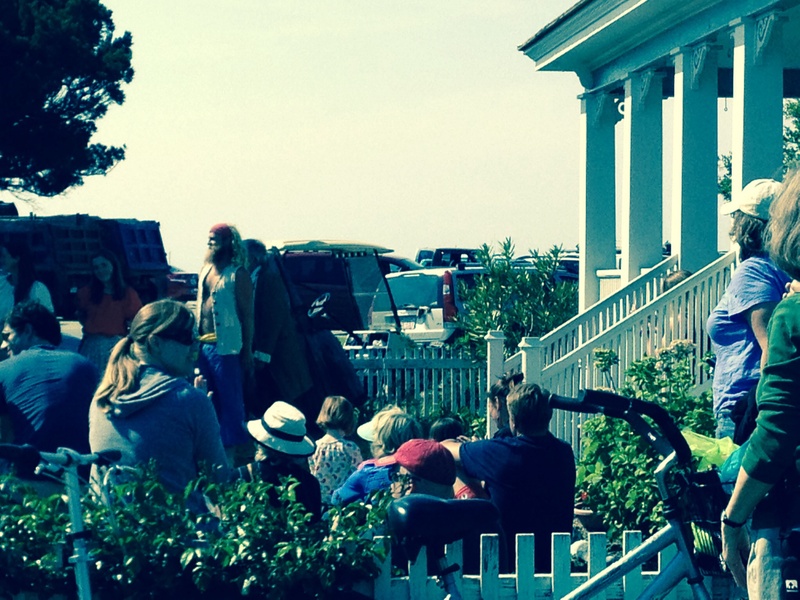 The horses roam the entire island – or so we hear. We anchored by the island and took the dinghy to the dock where the daily ferries arrive from St. Mary’s, GA and where the ranger station is located, and began exploring. 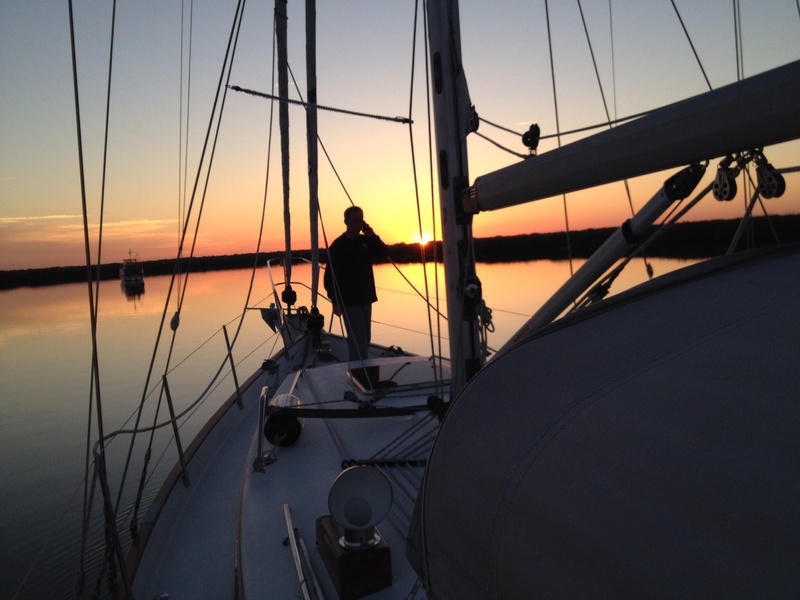 Captain happy to be anchored at Cumberland Island. This is the ferry that brings visitors over from St. Mary’s – the main means for people to visit the island. We were able to park our dinghy here. It was a chilly, overcast day which actually made for comfortable hiking. 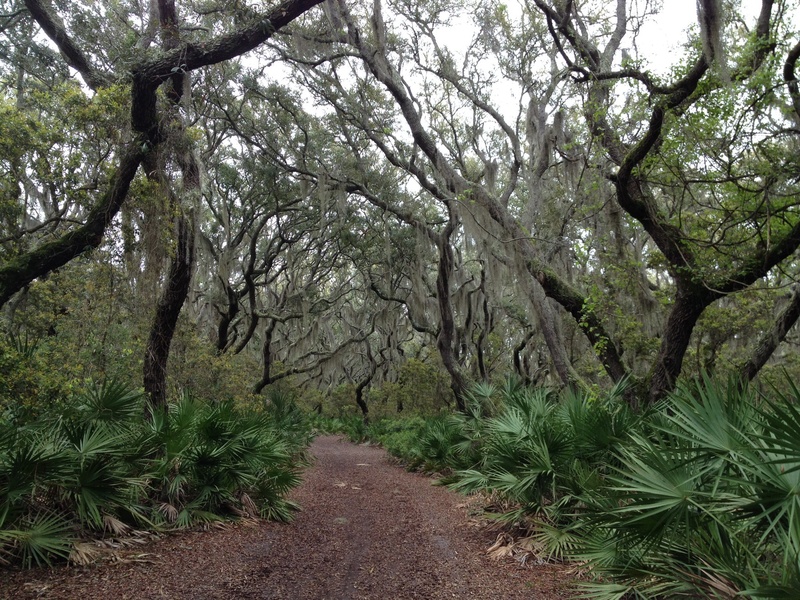 First, we followed the paths through the live oaks and spanish moss. Gorgeous! 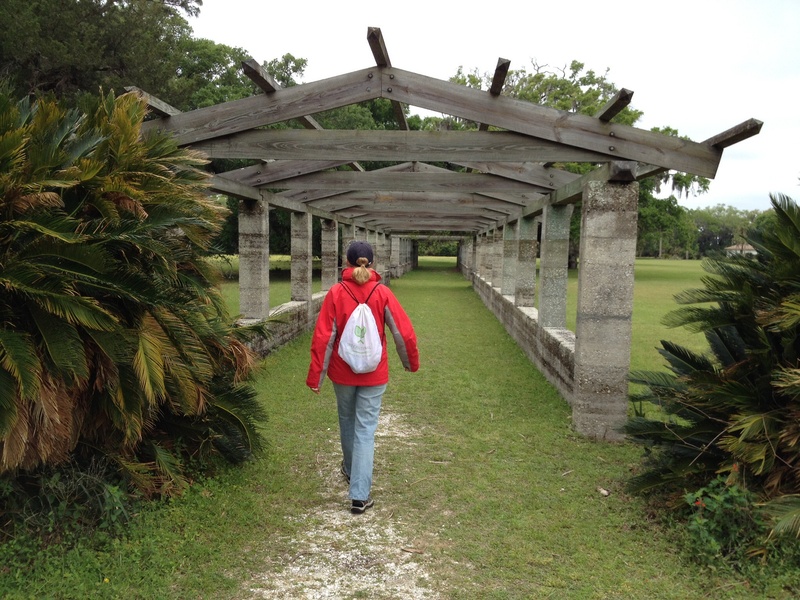 Following the marked paths on Cumberland Island. Spanish moss on live oaks – beautiful and spooky looking. Kept looking for wild horses . . .none to be found. Then we cut across to the beach. It was practically deserted with just a few other people wandering the island. We looked up and down. No wild horses . . . we kept walking. The beaches were wide open and stunning. Eventually we got to the Dungeness Ruins. (Dungeness is the name of the mansion and grounds – kind of like “Tara” from Gone With the Wind.) What a history of this site. I will give you the headlines. It’s pretty interesting, and remember, this place can only be reached by boat. – Original mansion was designed by Revolutionary War hero Nathanael Greene. He got the land in exchange for a bad debt. His widow built the original, four story tabby mansion on the site in 1803. – In 1818, Robert E. Lee’s father, Henry, moved into the house and stayed until his death and was buried there for a time. 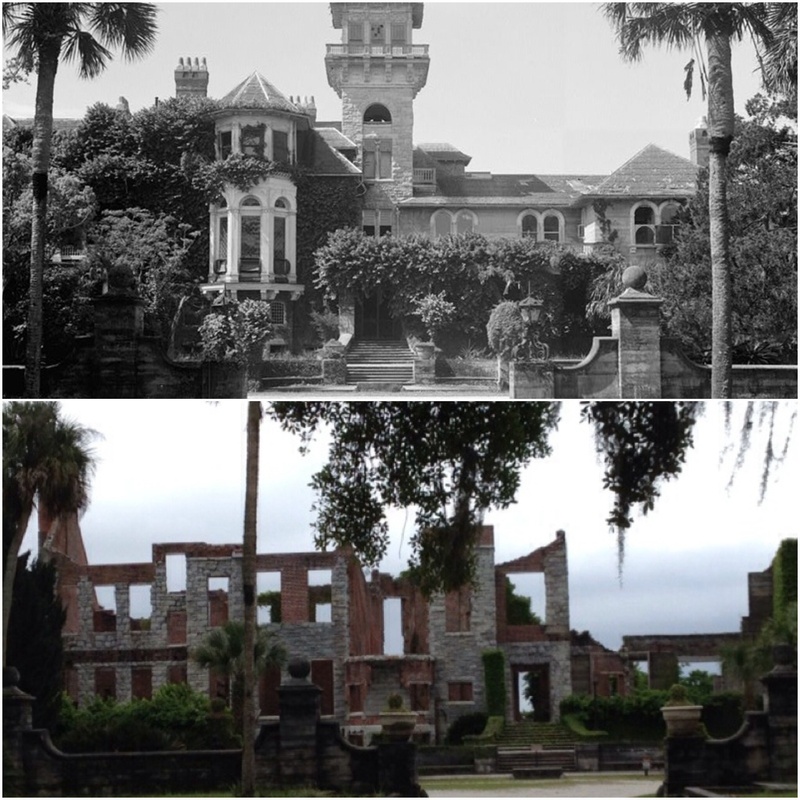 – Mansion is abandoned during the Civil War and burns down in 1866. – The Carnegies move out in 1925 and leave the mansion sitting empty. – The mansion burns in 1956 – arson is suspected. The remains of Dungeness are now preserved. From Magnolia’s blog and a visit about two weeks ahead of us: these horses were too lazy to even move out of the trail for them. This horse stood and posed for Anthony! 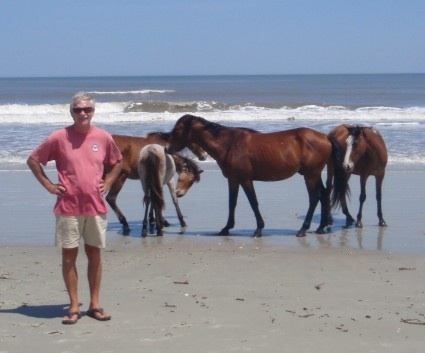 And here Brian from Mar-a-lago is just showing off with the horses on the beach. This was a few days after our visit there. And here’s what we’ve found so far: It ain’t right. 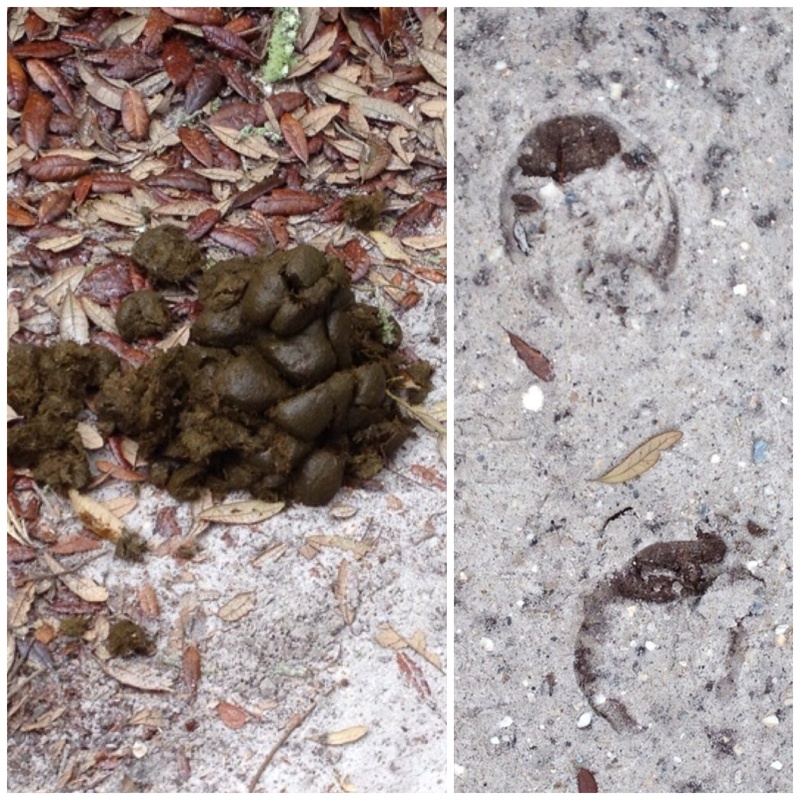 Hoof prints and other “evidence” of horses. Hey – poop happens. At last, far far in the distance, way far away, I spot . . . could it be . . . if I had binoculars I’d know for sure . 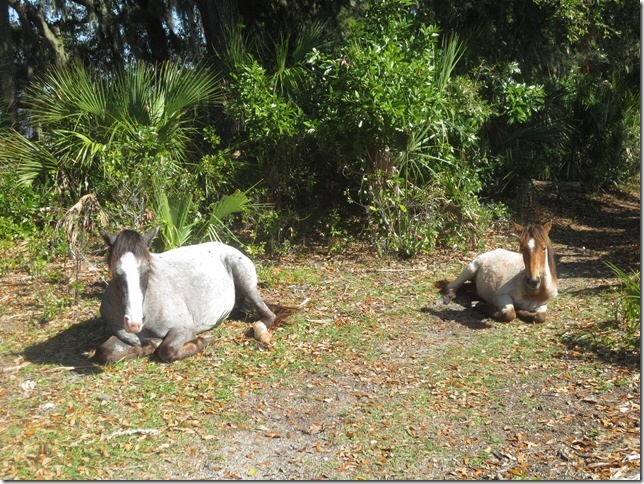 . . yes, it appears there are two or three wild horses! I think there are horses out there. That was as close as we ever got. Sigh. 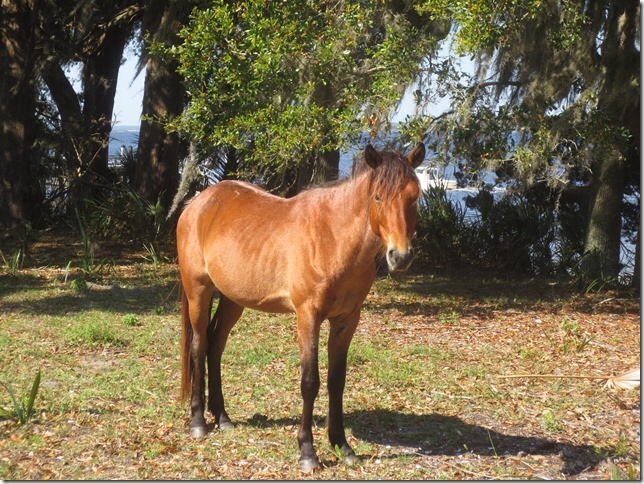 I’m changing the words to the Rolling Stones song “Wild Horses” to ” wild horses … couldn’t drag themselves out….” It was a delightful visit to Cumberland Island IN SPITE of the fickle horses. What a beautiful and interesting place. After that stop, we buzzed right on through the rest of Georgia, pausing only to anchor overnight by Raccoon Island south of Savannah. And so, the trek towards home continues!